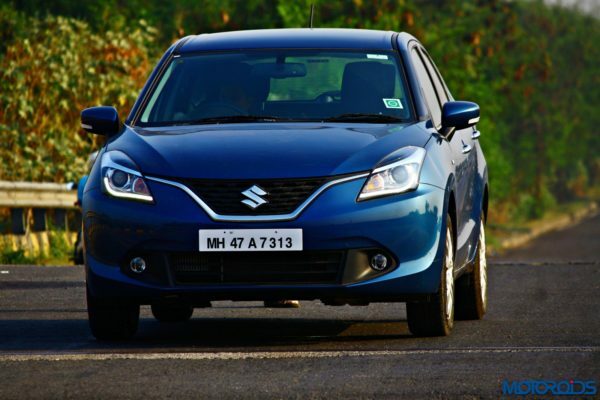 The Maruti Suzuki Baleno is the premium hatchback offered by the brand, which rubs its shoulders against the likes of the Hyundai Elite i20 and the Honda Jazz. 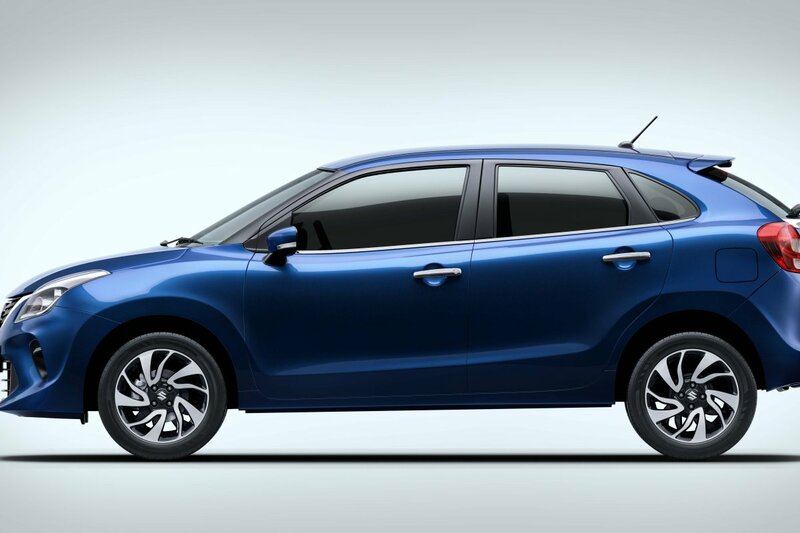 The Baleno is spacious, offers two engine choices and a good set of features. 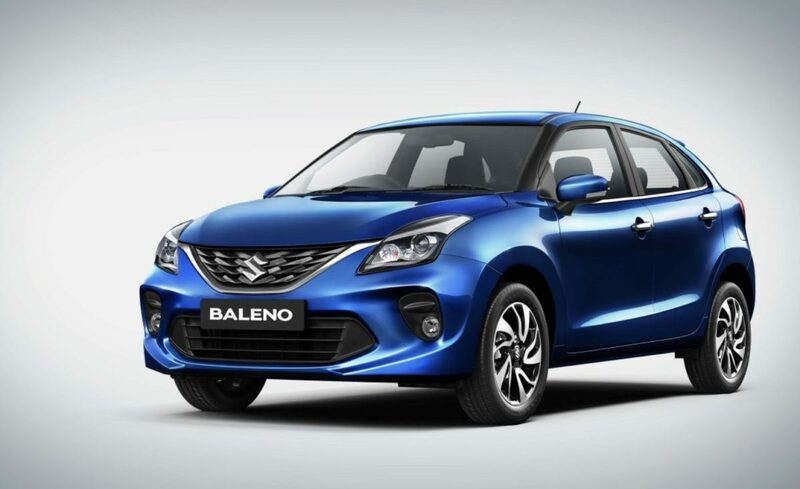 The Maruti Suzuki Baleno has been updated with its appearance for 2019. Some visual tweaks in its fascia, along with the newly introduced 16-inch dual-tone alloy wheels do add some freshness to one of Maruti's bestsellers. The front profile now houses a 3D graphic design grille with swept-back projector headlamps, LED DRLs and fog lamps. Sideways, the car gets body-coloured wing mirrors with integrated side indicators along with chrome door handles. Higher-spec variants also get an option of keyless entry. Completing the overall picture is the rear which comes equipped with LED taillights, a sporty looking spoiler with an integrated stop light, rear wiper along with rear parking sensors and a chrome strip which adds a dash of shine to the rear profile of the car. 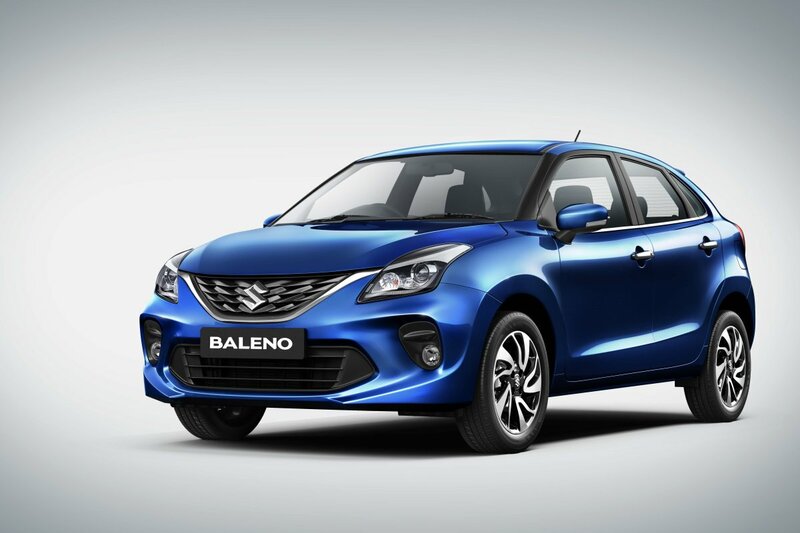 The Maruti Suzuki Baleno is a well-designed car that measures 3,995 mm in length, 1,745 mm in width and 1,500 mm in height. The car has a turning radius of 4.9m. 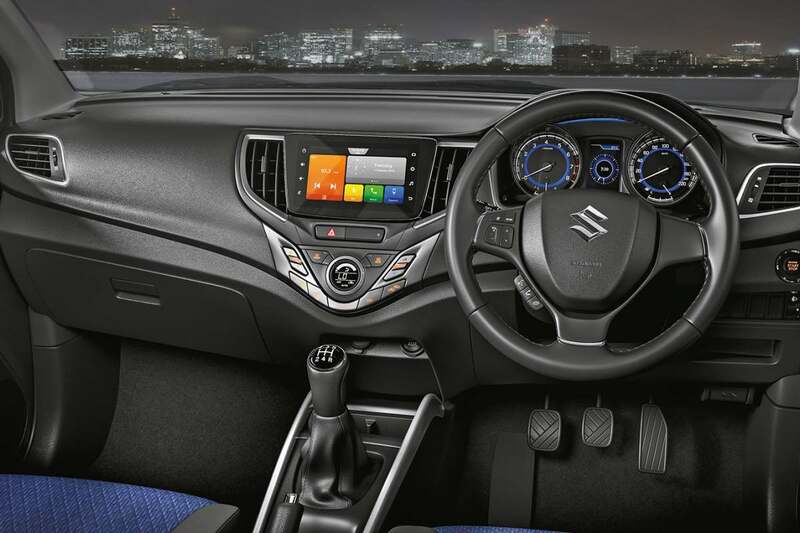 The Maruti Suzuki Baleno's cabin is spacious and wide. The seats offer a good amount of side and under thigh support and the navy blue texture on the seats looks quite nice. 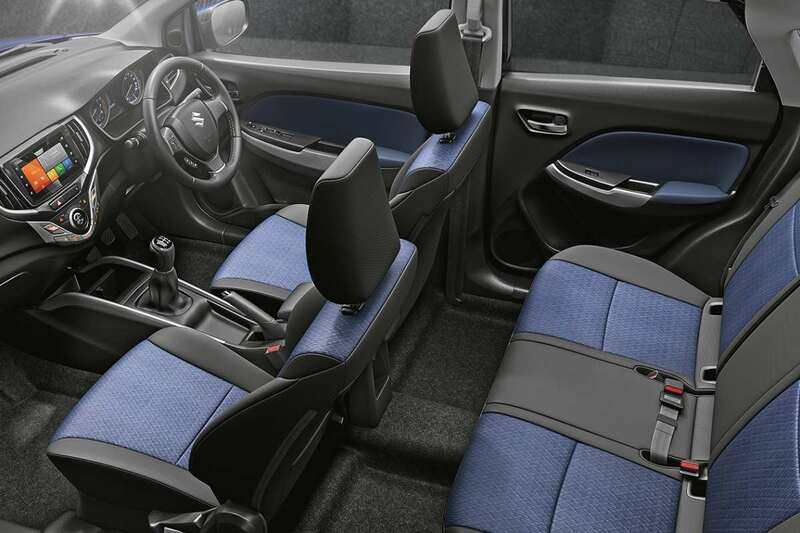 The seats also offer adjustable headrest in the first and second row along with a rear armrest. 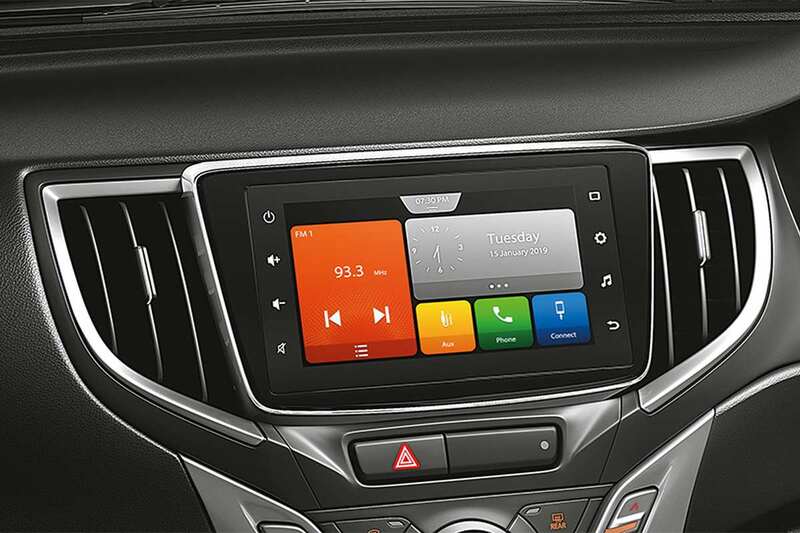 Infotainment needs are handled by a touchscreen infotainment system which is compatible with Apple Car Play and Android Auto. The plastic quality on the dashboard feels par for the course and some silver inserts on the centre console do make things look upmarket. 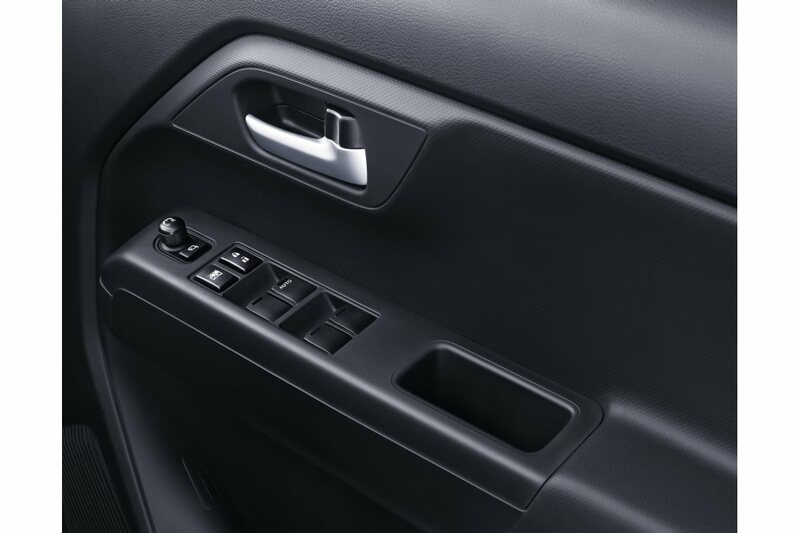 The air-conditioning system works well in cooling down the car's cabin in no time. The infotainment console can also be handled with the help of steering mounted controls. 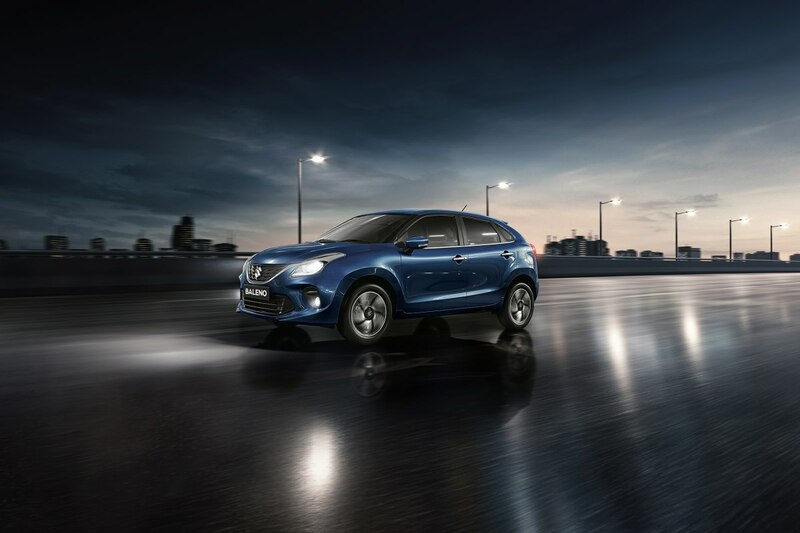 The storage spaces in the all-new Baleno consists of side pockets, glovebox, bottle holders, glass holders and 339-litres of luggage space. The instrument console features a screen which provides information regarding speed, fuel, distance, power/torque distribution among wheels and much more. 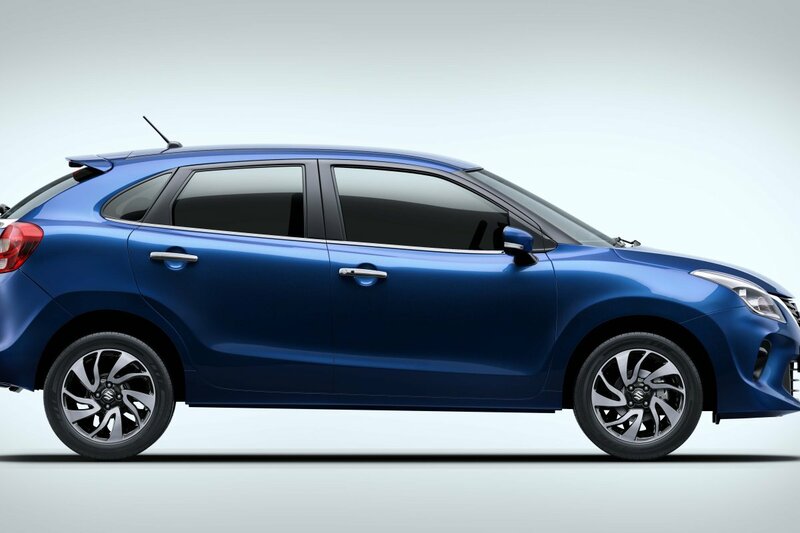 The Maruti Suzuki Baleno comes with standard features like ABS with EBD, driver and passenger airbags, high-speed warning, front disc brakes and reverse parking sensors. On the other hand, the top-spec trim sports additional features like rear wiper and washer, automatic headlamp on/off, front fog lamps and a reverse parking camera. Under the hood, the Maruti Suzuki Baleno is powered by a 1.2-litre petrol unit, developing 84 ps at 6000 rpm and 115 Nm at 4000 rpm. The petrol motor comes paired with either a 5-speed manual gearbox or a CVT. The Maruti Suzuki also offers with a 1.3-litre, diesel unit which churns out respective power and torque output of 74 ps at 4000 rpm and 190 Nm at 2000 rpm. Transmission duties are handled by a 5-speed manual gearbox with no choice of an automatic. Both the engines are fuel-efficient and are rated for 21.4 Kmpl (petrol) and 27.39 Kmpl (diesel). The gearshifts on both the transmissions are smooth and ensure good drivability throughout the rev band. The petrol unit is refined, rev-happy and feels great to drive. On the other hand, the diesel engine is fun to drive on highways and feels punchy. 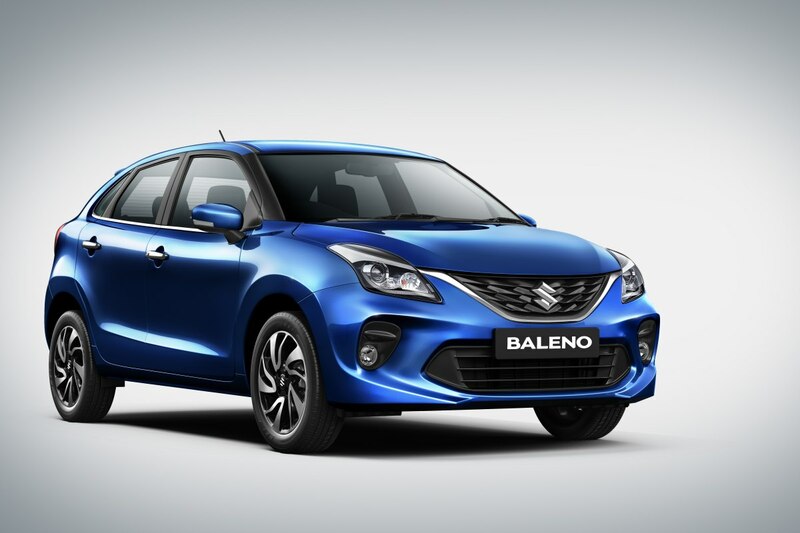 Maruti Suzuki Baleno price starts from INR 5.38 Lakh to INR 8.5 Lakh. Reincarnation has long been a mythological parable that many do believe in. So while some of you are still busy cursing life or feeling blessed, blaming it on the deeds of your past life, here’s a car that is a living example of rebirth. We tried finding out if it can trace some of it roots and excite the driver, or has it transformed entirely and come back with an untraceable DNA.